13.25" molded dial design features two brightly colored birds. Framed in a glossy white bezel. Shatterproof and weather resistant materials. Temperature range -60°F to 120°F. 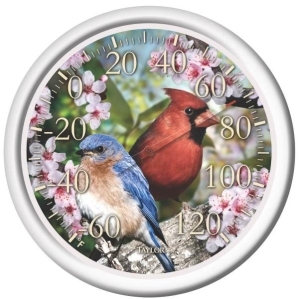 Largest available 13-1/2" molded dial design features two popular birds with silk screened graphics. Framed in glossy white bezel. 13.25" molded dial design with bold, clean graphics. Framed in a glossy black bezel.